Canberra is at the centre of a growing region. The Canberra Region offers a diverse range of jobs, services, tourism, lifestyle, housing and leisure opportunities. By leveraging opportunities presented by our position in the region and investing in transport networks, communication systems and urban settlement patterns, we can support our economy and the competitiveness of the region. 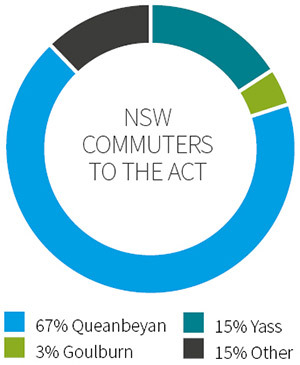 The intrinsic link with the region brings many economic benefits to the ACT, but also brings challenges to plan for; for example, additional transport, roads, parking, freight, housing and settlement, facilities and service provision. We will continue to collaborate with our NSW partners to coordinate and integrate growth and change to build on the strengths of the region as a whole. 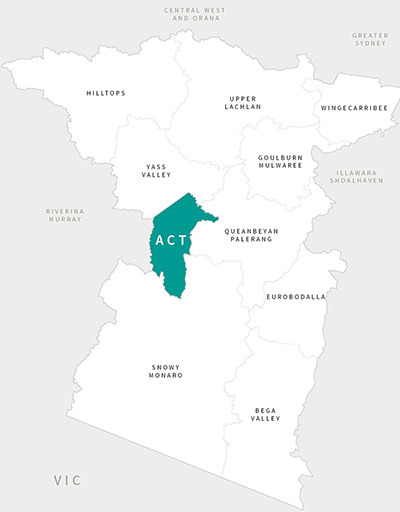 In the context of this Strategy, and the NSW Government's South East and Tablelands Regional Plan, the Canberra Region includes the Australian Capital Territory (ACT) and the surrounding NSW Local Government Areas of Bega Valley, Eurobodalla, Goulburn–Mulwaree, Hilltops, Queanbeyan–Palerang, Snowy Monaro, Upper Lachlan, Yass Valley and Wingecarribee. The ACT Government has led the formation of the Canberra Region Joint Organisation (CRJO) to partner with the NSW Government and these local governments on joint priorities like infrastructure planning and regional economic development opportunities. Image: Map of the Canberra region. Click to view larger version.